It’s a little known fact that Sir Henry Wellcome was something of a pioneer in aerial photography. Wellcome first visited Sudan in 1900, to establish what became the Wellcome Tropical Research Laboratories in Khartoum. Once the laboratories were established, he moved on to plan and carry out archaeological excavations in the area. 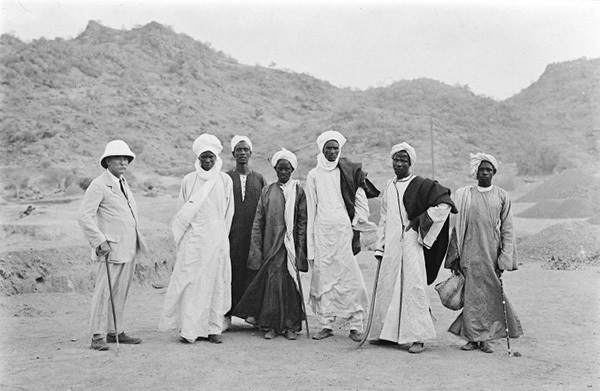 Between 1910 and 1914 he travelled to Jebel Moya in South Sudan where he was permitted by the military governor to begin a series of four archaeological excavations. Some rare film footage exists from the excavation. Henry Wellcome with Sultans of Socota [Jebel Moya]. Photograph, 191? Wellcome Images reference: M0008634. Wellcome brought in British archaeologist O.G.S Crawford to manage the site and the team of local workers. Crawford went on to become involved with photographic reconnaissance, propaganda photography during World War I, and an author on the subject of aerial photography. In the book Medicine Man, Crawford credits Wellcome for the invention of box-kite photography claiming that the Jebel Moya site was the first time air-photography had been used in archaeology. 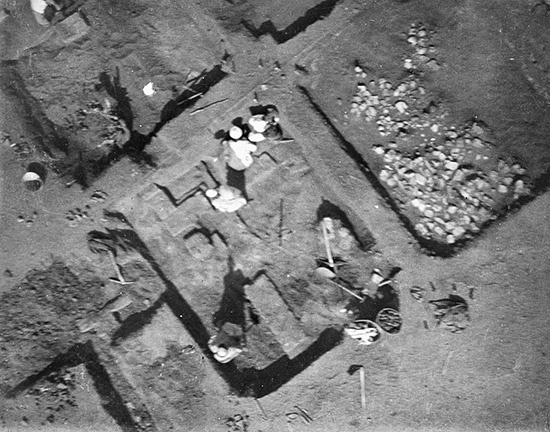 Aerial view of the excavation camp at Seqadi/Sagadi, Sudan. Photograph, 191?. 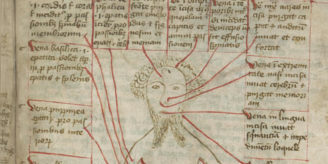 Wellcome Images reference: M0008631. Aerial photography provided an alternative view of the excavation site allowing, if conditions were right, detailed mapping and topographic study of the area. 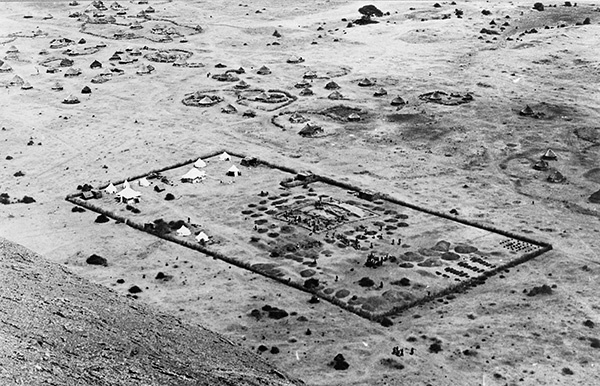 Aerial photograph taken with the ‘kite camera’, at Seqadi, Jebel Moya, 1913. Wellcome Images reference: M0013048EB. Rockets and pigeons were amongst the early methods of raising the camera aloft but most success came with air-balloons. A disadvantage of using air balloons for aerial photography was the risk to human safety. The cameras had to be manually operated once up in the air and the temptation was to have a large balloon-car to take up all manner of equipment and specialists, meaning the balloon would be heavily weighted. 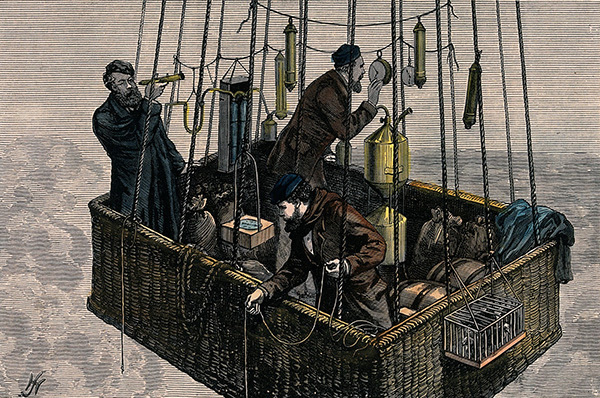 ‘The fatal balloon accident – car of the “Zenith” with the three aeronauts’. Wood engraving, date unknown. Wellcome Library reference no. 36313i. Safety was also an issue with Samuel Cody’s man-lifting kites, although they could lift a person as high as a balloon could be flown, and performed better in strong winds they still put the camera operator in danger. So attention moved to finding a way in to fire the cameras automatically. Explosive charges and lead weights were trialled but then without someone to position the camera in the right direction successful images could not be guaranteed. 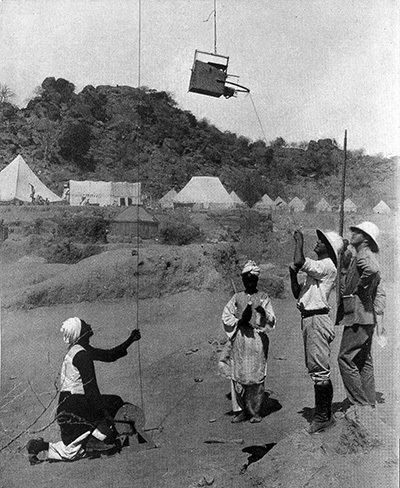 The ‘Wellcome’ kite camera in operation, Jebel Moya, 191?. Wellcome Images reference: M0001538. The large box-kite Wellcome used was manoeuvred using pulleys and fired remotely using a wire attached to the camera. Perhaps the pulley system, known as the ‘Kite Trolley’, that Wellcome and his team used went some way to providing a resolution to the problem of camera positioning. In Frank Addison’s account of the Jebel Moya excavations it states that no written details of the experiments with the kite trolley exist, but there are letters and papers relating to the kite trolley within the Wellcome archive at the Library. 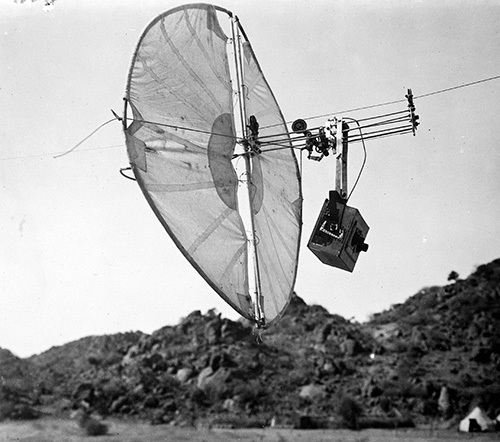 Remote operation of the kite camera, 191?. 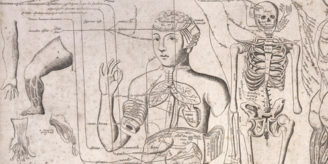 Wellcome Images reference: L0021185. Although aeroplanes and drones eventually took over from balloons and kites, kite-cameras were never made entirely redundant and are still being used by archaeologists today. The modern drone (unmanned aerial vehicle – UAV) suffers some of the same challenges as the old techniques, such as the need for flying skills and unpredictable weather conditions, along with some added extras such as battery life and its recovery once it’s landed. A drone in mid-flight. Image source: Wikimedia Commons. There is also a safety concern as bodily tissue would be no match for the fast moving rotors on these mini quad-copters. 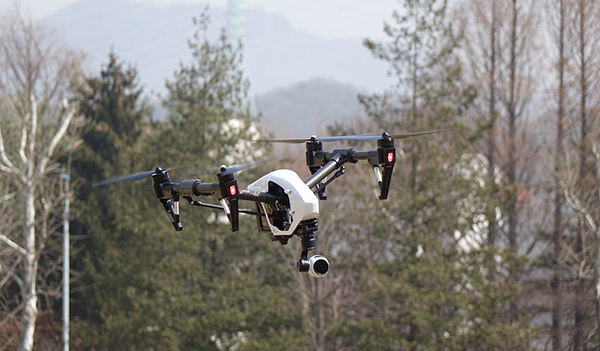 For safety and privacy reasons, the operation of drones is strictly regulated in many countries so like Sir Henry, you’ll need to get permission for your aerial photography.